Be inspired by the countless creative hanging baskets and containers. Since we grow most of the plants ourselves, we are able to have unique combinations of flowers that you cannot find anywhere else. If you cannot find the perfect combination planter at Waldoch Farm, we can create it specifically for you. Bring in your favorite container and we can fill it with a mix of plants to add just the right look for your patio or doorstep. Combine our creativity and experience with your inspiration and you've got a recipe for beauty. There is a wide variety of container sizes from 8" up to 20". You will find thrillers, fillers, and spillers compose our pots. Kathy loves to play with colors, leaf shapes and textures to make unique one of a kind designs. Our containers & hanging baskets are so full and beautiful many folks even use them as upgrades and plant them directly into larger containers or into their gardens. Early spring planting events allow you to get your hands dirty before anyone else. This allows you to get a head start on your mixed containers; before you get started Kathy gives a lesson on putting together a container. Then you plant your own container right in the Garden Center while the knowledge is fresh. Bring a pot from home or choose from our fabulous selection of pots and containers. Our vast experience with container gardening can guide you to select and design a beautiful container for any growing condition. 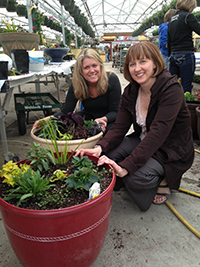 Bring a friend and share in the fun while you plant the container. After you finish, we will grow them in the greenhouse until you are ready for the container or pick up by Mother's Day. We offer Container Demonstrations throughout the year. Waldoch Farm is known for our creative container combinations and Kathy, our lead container designer, will be sharing her tips and secrets to basket success. The first set of demonstrations focus on creating beautiful containers in the spring to last the season. Come learn how to give your containers a new look for the fall season. 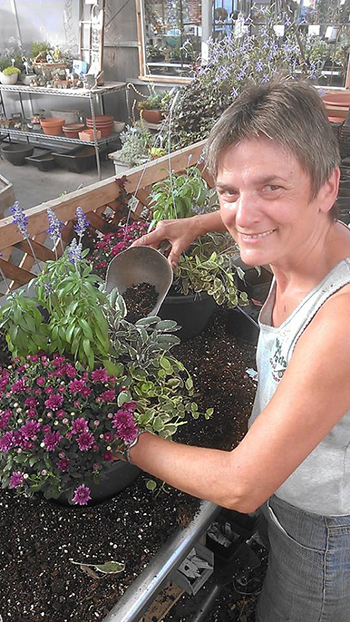 Whether it's creating a completely new container or swapping out plants, Kathy will demonstrate options and recommend seasonally appropriate plants. Just stop into the Garden Center during the demonstration, preregistration NOT required. Find more information about the events at Waldoch Farm. We take pride in having beautiful containers from April to October!